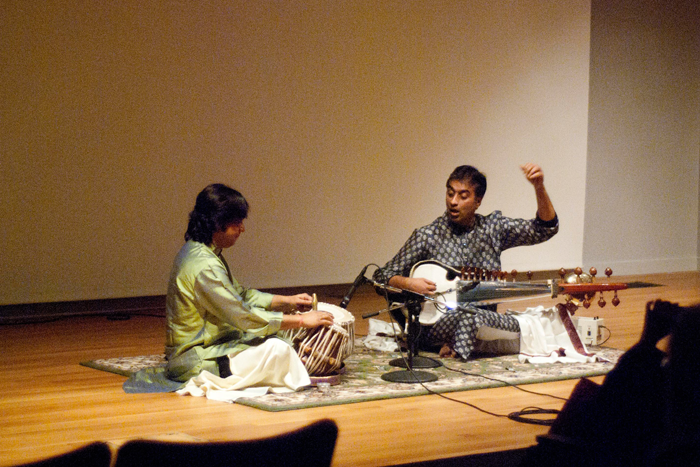 Our first event of the 2013/14 season was a performance by Dr. Rajeeb Chakraborty, internationally renowned Sarod player. 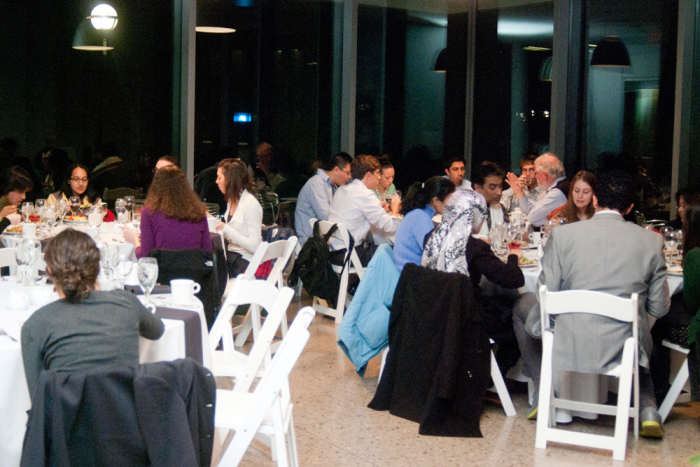 This event took place on Tuesday, October 29th at 6:00 PM at the University of Michigan Museum of Art (UMMA). 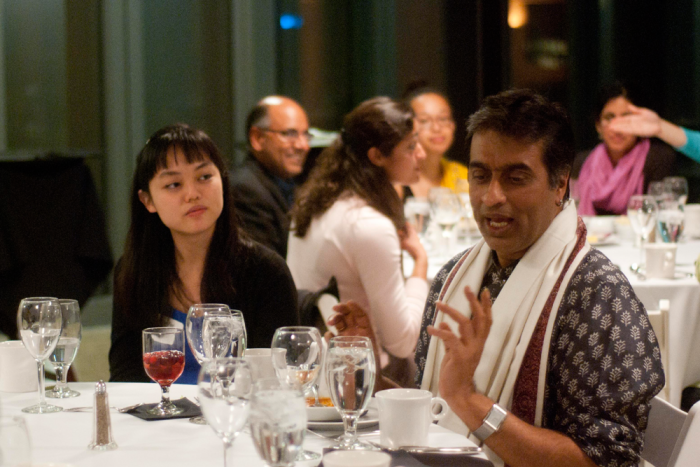 We began with a performance by Dr. Chakraborty and tabla musician Subrata Bhattacharya, after which he and special guests will be joining us in a dinner discussion catered by Food Art. An incredibly versatile musician, Dr. Rajeeb Chakraborty is a performer, educator, conductor, and composer. He started playing the Sarod at age six under the guidance of his father, Pandit Rabi Chakraborty, and has been performing since the age of nine. In addition to his work with classical Indian music, he also holds a degree in western music from the Royal College of Music in London. 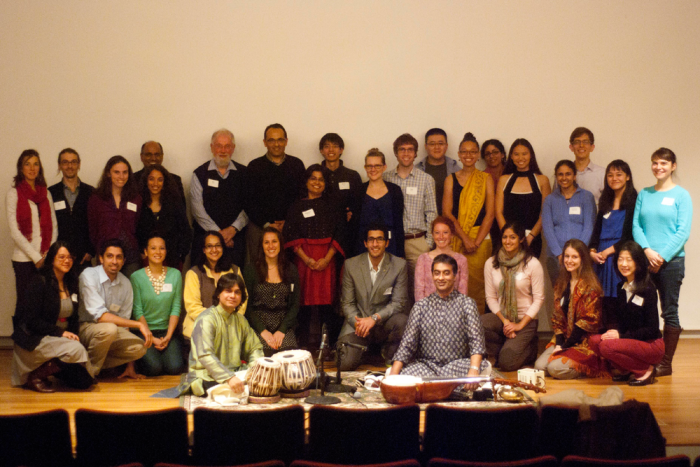 Dr. Chakraborty wrote his dissertation on "The role of computers in learning and teaching North Indian classical music" and strives to make Indian classical music accessible to a broad international audience. Subrata Bhattacharya is tabla musician of note on the Indian classical music scenario, and his accomplishments and achievements in the field of percussion music have earned him name and enviable fame. Subrata is one of the leading tabla players in India today. 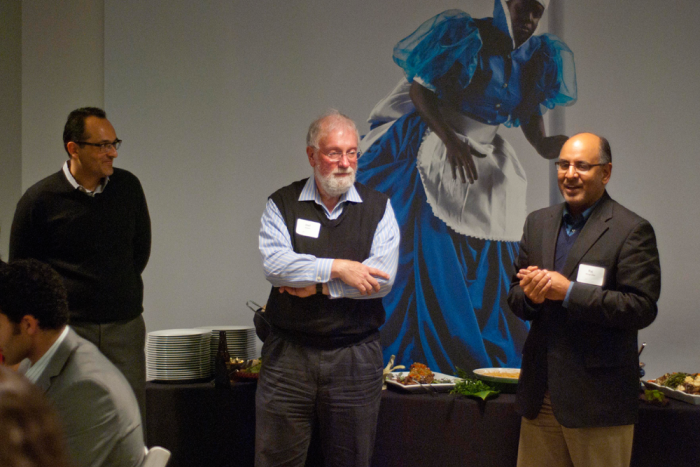 For this event we were also joined by special guests Mousumi Banerjee and Dan Piccolo. Professor Mousumi Banerjee is a faculty member in the Biostatistics Department and is the Director of Biostatistics at the Center for Healthcare Outcomes and Policy (CHOP). 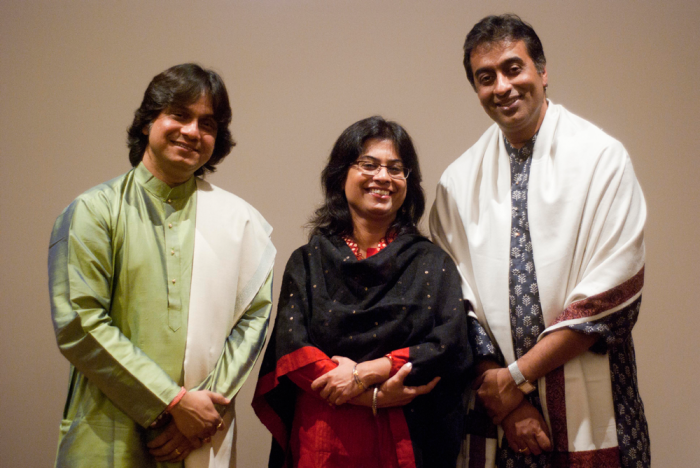 She is also a singer and local performer of Indian classical music, and has been instrumental to the conceptualization and coordination of Dr. Chakraborty's residency. Dan Piccolo is a local drummer, percussionist, and was a principle organizer of one of Dr. Chakraborty's public performances. This event is a part of Dr. Chakraborty's larger residency at the University of Michigan through the Center for World Performance Studies. From the moment the musicians started warming up and tuning their instruments, we knew it would be magical. It was almost difficult to tell when they stopped tuning and when they started playing. Dr. Chakraborty and Subrata Bhattacharya explained that their sarod and tabla would be having a musical conversation and that none of it was preplanned. 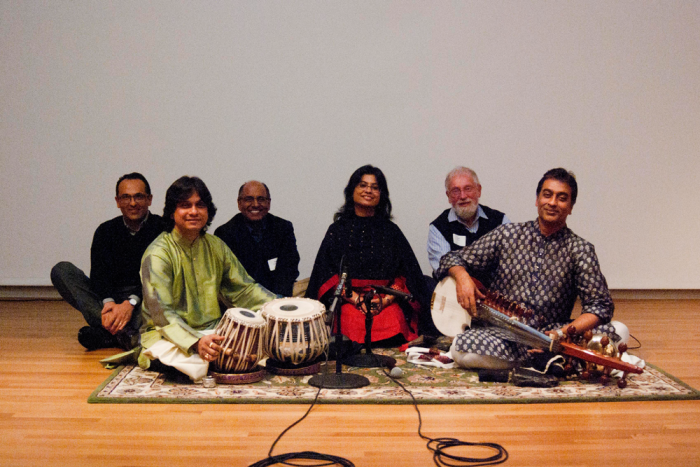 But they also explained that it wasn't simply improv; it was 20+ years of learning traditional ragas. They used those ragas as the basis for their conversation, but they broke the rules as well. Being a new listener to traditional Indian music, I found myself initial mellowed and nearly hypnotized by the drone. Then the table came in and I was counting beats. But a few minutes into the song I realized I could no longer frame what I was hearing with Western musical training. It was intially unsettling that I couldn't understand what I was listening to, but when I finally relaxed into the music the conversation became more clear. It was a surprise that in order to really appreciate the music, I had to first get rid of any preconceived notions of music itself. After the performance we had dinner and an informal discussion with the musicians, which is always my favorite part of the Med Arts events. We were able to dig deeper into the music, and learned more about the musicians themselves. This seemed instantly relate-able to medicine, in which we will at times have to do away with notions of how things should be, and instead focus on what they are and how they are perceived by others.